A few years ago, we saw the reverse engineering of the Lattice iCE40 bitstream, opening the door to a completely Open Source development tool chain for FPGAs. This was an astonishing amount of work from [Clifford Wolf], [Mathias Lasser], and [Cotton Seed], but since then we haven’t seen a whole lot from Project IceStorm. Now, that’s about to change, and in the coolest way possible. [hoglet] is retrocomputing on an ICE40 development board. This is an implementation of the Acorn Atom on a myStorm BlackIce board. This board is basically just a Lattice iCE40 FPGA, a few support components, and a bunch of pin headers, some of which are in the not-so-handy Arduino pinout footprint. By porting some Acorn Atom implementations and a 6502 core to verilog, [hoglet] was able to stuff a cool old retrocomputer onto an Open Source FPGA development board. Video output is through a resistor DAC driving a VGA cable, and keyboard input is through PS/2. Just about everything about this Open Source implementation of the Acorn works, and there’s still a lot left in the iCE40 FPGA. [hoglet] is able to run the 6502 core at 25MHz, which means just about every 6502-based system should be able to run on the BlackIce board. Through-hole resistors come on tape that we’re now calling bandoliers. Since [Spencer] is selling a boatload of his RC2014 backplane computer kits on Tindie, he’s been chopping up a lot of resistor bandoliers. It’s a boring and monotonous job. Fortunately, a lot of people have had a bandolier cutting problem over the years, and there are some hobbyist-grade robots that will do this work for you. One of the more popular robots tasked for bandolier cutting is a laser cut robot. However, if you already have a laser cutter, why not just use the laser to cut the bandoliers? It’s brilliant in its simplicity. [Spencer] spent a little bit of time designing a template to turn his laser cutter into a cutter for through hole resistors. No, he’s not trimming the leads — this is just a device to cut resistors into groups mini bandoliers of a handful of resistors. The tool is made out of plywood, with a smaller top piece held down with magnets to keep the resistors aligned. The entire template is up on Thingiverse, and it’s great if you need to cut hundreds of resistors to kit dozens of projects. If you’re only doing one or two, scissors will be the way to go, but if you’re cursed with the monotony of trimming hundreds there’s no better way to get things done than to put a robot to work. A naked flame is a complex soup of ionised gases, that possesses an unexpected property. As you might expect with that much ionisation there is some level of electrical conductivity, but the unusual property comes in that a flame can be made to conduct in only one direction. In other words, it can become a diode of sorts, in a manner reminiscent of a vacuum tube diode. [Paul Stoffregen] has made use of this phenomenon in a flame detector that he’s built to be installed on a Burning Man flame-based art installation. It forms part of a response to a problem with traditional pilot lights: when the wind blows a pilot light out, a cloud of unignited gas can accumulate. The sensor allows the pilot light to be automatically re-ignited if the flame is no longer present. The circuit is a surprisingly simple one, with a PNP transistor being turned on by the flame diode being placed in its base circuit. This allows the intensity of the flame to be measured as well as whether or not it is present, and all at the expense of a microscopic current consumption. A capacitor is charged by the transistor, and the charge time is measured by a Teensy that uses it to estimate flame intensity and trigger the pilot light if necessary. Interestingly it comes from a patent that expired in 2013, it’s always worth including that particular line of research in your investigations. All the construction details are in the page linked above, and you can see the system under test in the video below the break. Spoiler Alert! Repairing A Race Car Can Get Complicated, Fast. [Big Fish Motorsports] has a vehicle with an adjustable rear spoiler system that broke in the lead up to a big race. The original builder had since gone AWOL so the considerable talents of [Quinn Dunki] were brought to bear in getting it working again. Cracking open the black control box of mystery revealed an Arduino, a ProtoShield and the first major road block: the Arduino remained stubbornly incommunicado despite several different methods of trying to read the source code. 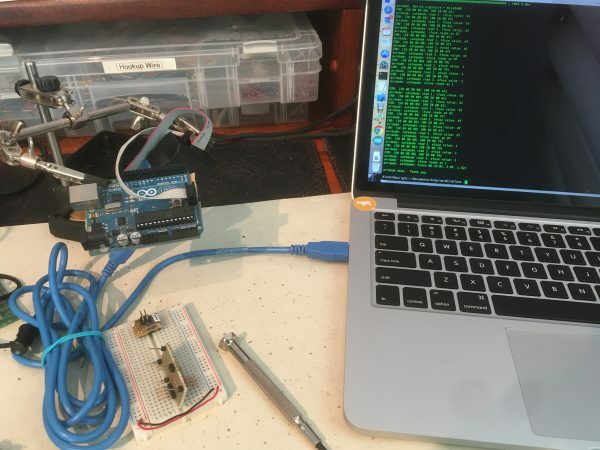 Turns out the Arduino’s ATMega324 was configured to be unreadable or simply fried, but an ATMega128 [Quinn] had proved to be a capable replacement. However, without knowing how the ten relays for this spoiler system were configured — and the race day deadline looming ever larger — [Quinn] opted to scrap the original and hack together something of her own design with what she had on hand. This year, the Hackaday Prize is going to find the most innovative and interesting assistive technologies. Whether that’s refreshable Braille displays or reliable utensils for the disabled, the finalists for the Assistive Technologies portion of the Prize will be creating some of the most interesting tech out there. For his entry into the Assistive Technology part of the Prize, [Pawit] is building binaural glasses for the blind. It’s difficult to navigate unknown environments without a sense of sight, and these SonicScape glasses turn cheap distance sensors into head-mounted sonar. The glasses are built around a pair of ultrasonic distance sensors (the HC-SR-04, if you’re curious), mounted in a convenient 3D-printed enclosure that looks sufficiently like a pair of glasses to not draw too many glares. (Although maybe we’d print them in black to lower the contrast.) Of note in this project is the Bluetooth connectivity to eliminate wires and independent left and right audio channels. That last bit — being able to hear in left and right — is something we haven’t seen before in devices like this and aims to greatly increase the usability of such a device. Do you know what time it is? Chances are good that you used a computer or a cell phone to answer that question. The time on your phone is about as accurate as chronometry gets these days. That’s because cell networks are timed from satellites, which are in turn timed from atomic clocks. And these days, it may be that atomic clocks are the only clocks that matter. Before this modern era of quartz and atomic accuracy, though, timepieces were mechanical. Clocks were driven by heavy weights that made them impractical for travel. It wasn’t until the mainspring-driven movement came along that timekeeping could even begin to become portable. But while the invention of the mainspring made portable timepieces possible, it hurt their accuracy. That’s because the driving force of a tightly wound spring isn’t constant like that of an inert, solid weight. So pocket watches weren’t exactly an overnight success. Early pieces were largely ornamental, and only told the hour. Worst of all, they would slow down throughout the day as the mainspring unwound, becoming useless unless wound several times a day. The mainspring wasn’t the only problem plaguing pocket watches, but it was the among the most obvious. In a post on the Upverter blog today, [Zak Homuth], founder of the online EDA suite Upverter has announced they have been acquired by Altium. The largest change in the announcement is the removal of Upverter’s paid professional tier of service. Now, the entirety of Upverter is free. Previously, this paid professional tier included CAM export, 3D preview, BOM management, and unlimited private projects for $1200 per seat per year. Hackaday has taken a look at Upverter before in an book-length series of posts describing how to build a PCB in every software tool. While Upverter is a web-based PCB design tool that doesn’t respond to a right mouse click, the experience was pleasant overall. There are some interesting features in Upverter that make PCB design work fun — snap-to alignment of pads, a phenomenal number of ways to export your data — and it’s more than capable enough for the electronics hobbyist. With the Altium announcement, [Zak] says Upverter will continue on its mission to create a system to design a complete product, from schematic to enclosure to firmware to BOM management.